Hosted at the Government House on Saturday, December 13th, the party saw children from various pre-schools around the island indulging in goodies such as snow cones, popcorn, ice cream, juice, cheese sandwiches and sausage rolls. The Governor-General Sir Frederick Ballantyne, who was accompanied by his wife and children, related how immensely he enjoys the party each year. 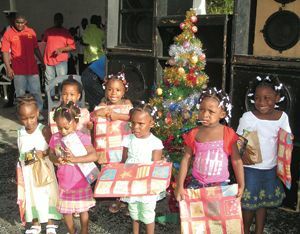 âIt is done to show our combined love for the children of St. Vincent and the Grenadines,â he expressed. President of the Rotary Club (St. Vincent) Brian George was delighted by the sizeable turnout of pre-schoolers. âIt really makes our hearts glad to be involved in this!â he exclaimed. George also related that every year the childrenâs party has been a success and he was overjoyed that this yearâs event has followed in the same vein. With smiling faces and loud voices, the pre-schoolers had their turn at the microphone when they went up to give their renditions and own interpretations of Christmas carols. A very jolly, albeit slim, Santa Claus whipped the children into a frenzy when he arrived to distribute Christmas presents. Carlton âC.Pâ Hall was also on hand to provide entertainment. The Royal St. Vincent and the Grenadines Police Band entertained the crowd with a rousing medley of Christmas songs. And the infectious rhythms left children and adults alike with no other option but to stand up and dance to the music. The invited Pre-Schools included VINSAVE, YWCA Day Nursery, Salvation Army Pre-School, Methodist Pre-School Kingstown, Kingstown Day Nursery, First Impressions Pre-School Mesopotamia, Glebe Pre-School Barrouallie, Red Cross Pre-School Chateaubelair, Fitz Hughes Pre-School and the Theodora McKenzie Pre-School Rose Bank.